Oh you better know that this is official, because it really is, Conor McGregor vs Floyd Mayweather is happening, and there is no doubt that this fight is going to be one of the most important fights of the century in combat sports period. Do you realise the implications for MMA from a ratings perspective if Conor McGregor gets beaten with ease by the most successful boxer ever? It will undoubtedly hurt the UFCs stock, but they will carry on and continue to blossom into whatever WME-IMG are thinking of. But CAN YOU IMAGINE the seismic vibrations that would occur within combat sports if Conor McGregor were to defeat Floyd Mayweather in a boxing match? The death of boxing? It sounds overly dramatic, but really if an 0-0 boxer can beat a 49-0 multi champion professional boxer, I could literally see majority of boxing fans switching their interests over to MMA. Might sound like some kind of impossible alternate reality to many, but combat sports is often unpredictable. Now with Conor and Floyd openly agreeing via social media that the fight is on, everyone is just waiting for a date and venue to be announced. In terms of the contest itself, many feel that it is a complete mismatch, due to the fact that Floyd Mayweather is basically the most decorated and richest boxer in history at 49-0 making hundreds of millions per fight, and Conor McGregor is 0-0 as a professional boxer. But this is what I want to highlight here for a second, I am going to say this categorically – Conor McGregor is not 0-0 as a boxer, so get that out of your mind because its an illusion. If I’m confusing you then ask yourself – How many 0-0 boxers are natural fighters that are 21-3 in unarmed combat, 86% of wins via KO, and are the only two weight world champion in UFC history? Obvious to say none right. That’s what makes this fight intriguing to people, because Conor McGregor is a unique athlete in the world of MMA, and while he has pluses and minuses to his game in MMA like everyone, how does Conor win the majority of his fights? Via boxing techniques, which are at times mesmerising, particularly his power. Also Conor has been training with pro boxers for a long time the likes of Conor Wallace, Michael Conlan, Paddy Barnes and many others. So what I’m saying here is don’t get distracted by the 0-0 next to Conor’s name when this fight is announced in the ring. So how do they really stack up? Floyd Mayweather is considered to be one of the best boxers in history, an orthodox fighter that is without question the greatest defensive boxer of all time – his footwork, head movement, shoulder rolls, parrying and counters are something to behold, truly legendary stuff. This is of course on top of his unbelievable technical offensive boxing which he can switch to in an instant to land beautiful combinations when coming forward. This has all culminated in Floyd Mayweather having the greatest ever pro boxing record at 49-0, and a win over McGregor would take him to 50-0 which would eclipse even the legendary Rocky Marciano’s famous undefeated record. g, but in an MMA bout, I firmly believe Conor would beat Floyd Mayweather reasonably easily due to McGregor’s highly effective kicking game in MMA. While training boxing, and using boxing techniques in MMA fights is not new for McGregor, having a professional boxing match is definitely new territory for him. Conor is predominantly a southpaw, and southpaws have given Mayweather some issues in the past, but Conor also likes to switch between orthodox and southpaw, in a very karate style base with his footwork, where he mixes in a great kicking game. 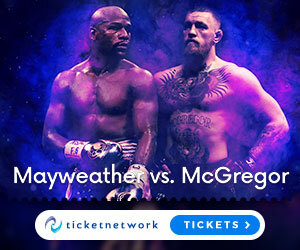 But there will be no kicks allowed in the boxing ring, but Conor will also have a significant size advantage – McGregor currently fights at 155 pounds, and has even fought at 170 pounds, while Mayweather has spent his career at 146 pounds or less. few inches on Mayweather in height and reach – Conor is 5 ft 9″ with a 74″ reach, while Floyd is 5 ft 8″ with a 72″ reach, so their is no question that Conor will be the bigger man. Now I know Jose Aldo, Nate Diaz and Eddie Alvarez are no Floyd Mayweather in boxing skill, but if you look at how easily McGregor beat Aldo and Alvarez, and how many times he dropped Diaz – are you guys learning yet that Conor has some special power in his hands? Now with smaller gloves in MMA, there is not much protection for the fighter getting hit, but with larger gloves there is more protection from blows in boxing. But when Conor doesn’t have to worry about being taken down, do you think that will decrease or enhance his punching power? Regardless of the gloves its an easy answer right. Conor will be able to hit Floyd harder then anyone he has hit before in MMA, that is of course if he can catch Floyd which we all know is so hard to do. Also last but not least lets not forget the fact that Floyd is 40 years old, and Conor is 28, so age could also play a factor when these two collide. So anyone who thinks Conor has no chance in a boxing match against Floyd, needs to comeback and read this article. So we know that Conor McGregor vs Floyd Mayweather is happening, and now we have teh date and venue set for August 26th 2017 at teh T-Mobile Arena in Las Vegas, Nevada. If you want to book a ticket right now then you can do that right HERE. And with regards to who will win this boxing match – well it could be a case of both fighters being able to defeat each other with ease in their own worlds, but who really knows? Combat sports is never predictable, so this is why we will all tune in to see it. I hope you enjoyed this post, and if you have any comments or questions, then drop them below and I will get back to you asap. Don’t forget to subscribe, and stay tuned for more on this historic bout and everything related to the world of MMA right here at the MMAGateway. Hiya, I been following Conor Mcgregor for a long time and your right trained with the best in Ireland in the boxing ring, He was a boxer before he took up MMA and seeing how good he is in the octagon fighting the best could prove something good in the end against Floyd Mayweather, I did train in straight blast gym where Conor once started out and the work ethic is second to none. very reputable in their training. all I can say this will be a very interesting fight, an underdog in the professional world of boxing that is Conor McGregor V Floyd Mayweather. the greatest boxer this world has ever seen. I,m just hoping this will last the distance. Hi Michael, sounds like you know about Conors abilities first hand, and yes SBG are known for their excellent training regimes, Conor still trains with John Kavanagh, Artem Lobov and Cathal Pendred who are all SBG originals. I think your fired up for Floyd vs Conor like me, and as soon as a venue and tickets are anounced you can come back to this post to book your seat for this legendary bout. I really don’t think it would be much of a match for either. If the fight is in a boxing ring Floyd is going to punish McGregor. Same applies for Floyd if they fight in MMA ring. It wouldn’t be a fair or even match for either. I don’t even think that they will fight. I think that it will be more for money than an actual fight. Know what I’m saying? Hi James, yeah i do know what your saying, it is possible that Conor would beat Floyd easily in MMA, and Floyd would beat Conor easily in boxing. But from my perspective, Conor is far more ready for a boxing match then Floyd is for MMA, and Floyd would likely never fight in MMA. This boxing match will be happen mark my words, and as soon as the date is set you will hear about it right here at MMAGateway. Hey, I cant wait to see that fight. I cant even imagine how a fight between undefeated boxer Floyd Mayweather vs McGregor one of the greatest mma fighters in the world. Of course I think that Mayweather will beat Conor but still I cant wait to see that fight. Great article, it gave me some more insight on what I can expect from this fight and it was very informative. Hey Rolands, glad you like the article, have you been to any live events before, this is a great first start seeing Conor vs Floyd, and yes you might be right on the outcome. You might like this card also.